When you evaluate open cell vs. closed cell insulation, there are cost differences that you may consider when designing your next project. A light density, open-cell spray foam insulation like Icynene Classic, can be installed at a significantly lower cost than a closed-cell foam in projects targeting the same R-Value* specification. Some restriction may apply with interior space limitations. 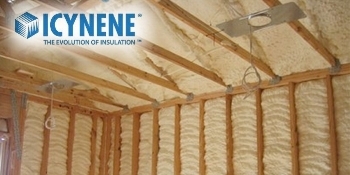 Since pioneering modern open-cell spray foam insulation, Icynene has become the spray foam insulation leader and one of the most familiar insulation products among builders. In fact, builders across the United States have come to trust Icynene spray foam insulation for performance, quality and innovation.